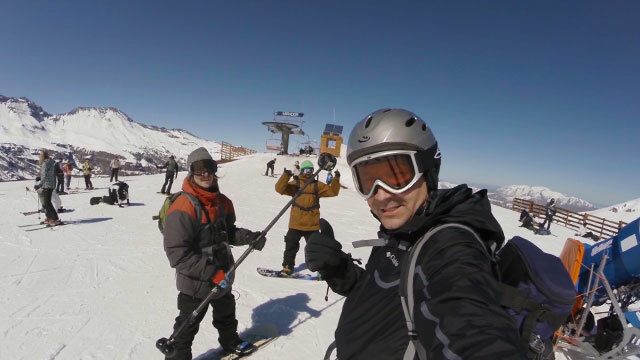 360 Labs helped Google & Columbia Sportswear on this eye-opening comparison of 360 video advertising with traditional video. In August of 2015, still reeling from our adventures in the Grand Canyon where we tested the Google Jump prototype, 360 Labs got another challenging project from Google. 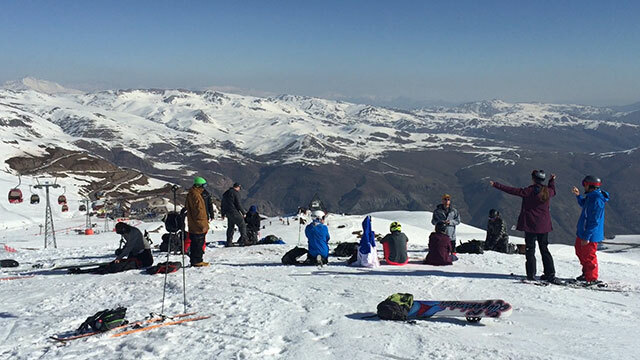 They wanted our help to shoot 360 video at the famous Valle Nevado ski resort in Chile with US Olympic Ski Team athletes Hannah Kearney and Keaton McCargo. Not only that, but they needed us ready to shoot in less than 2 weeks! Despite the short notice, we were able to pull together a two man crew along with a drone operator in time to get down to Chile for an epic adventure! Why all the rush, you ask? Well, Google’s goal in mind for this project was to test a traditional flat video campaign with a 360 video. It just so happened that Columbia Sportswear was planning to be in Chile working with Kearney and McCargo, and agreed to partner with Google to produce a 360 version of the current ad they were already shooting. 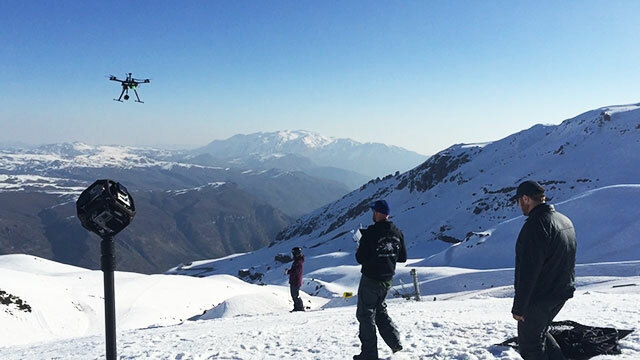 Since we were considering aerials with 360 video at elevations in excess of 10,000 feet, we knew that we needed trustworthy professionals flying our rig, which is why we chose to work with Aerial Technology International. On short notice, they put together a great drone package for us and booked an incredible pilot. Lifting thousands of dollars worth of equipment in these conditions is no joke. ATI’s pilot Travis Stanton delivered some of the best aerials we’ve ever worked on. If you’ve seen our 2015 reel, you may have noticed two of those shots. Although we couldn’t mention her name at the time, the skier running moguls in our reel is in fact Keaton McCargo, of the U.S. Freestyle Ski Team. The standard video ad was shot by T-Bar Films, a media cooperative known for it’s amazing outdoor and ski cinematography. T-Bar also handled the editing of both pieces, so that the story would be similar in both mediums. For a quick turnaround, we delivered low resolution 1920x1080 rough stitches to begin the editing process. Once actual clips (or selects) were chosen, we painstakingly fine stitched each select in 4k, stabilized, and applied color grading and effects as necessary. Columbia also brought in Chilean locals from Vacations on the Moon Films. These guys were a huge help to the production, thanks to them we were able to avoid a $35,000 fine for flying our drone. They also knew everything about the local area, and helped to plan logistics to get us where we needed to be on time, all while capturing awesome b-roll and photos the whole time. Our goal with the project was to simply do what we do, capture the experience in full 360x180. Although the videos would be similar in content, each medium would play on its strengths. While we had some specific shots we had to mimic from the standard ad, it was also up to us to go out and capture anything we thought would be engaging in the 360 medium. We brought a lot of tricks in our bag this time around, including a gyro stabilizer that could be carried by a skier or snowboarder. To setup the test, Google asked for a shorter 1 minute trailer for each medium, with the call to action for the viewer being to watch the full 3+ minute video. For about 90 days, these videos were unlisted on YouTube and could only be discovered by those who saw the ad or had peer-to-peer links sent to them. Each trailer was aired approximately 250,000 times. Google concluded that the standard ad actually outperformed the 360 ad in terms of view-through rate, meaning more people watched the entire standard ad trailer. However, the 360 ad had a higher click-through rate, so more people were abandoning the 360 trailer early to go watch the full experience. Also, of those who made the jump to the full video experience, the 360 ad viewers were more likely to share, subscribe and view other videos. Overall, the 360 ad drove 41% more earned actions than the standard ad. The 360 ad also received 46% more traffic by the end of the test. Because the videos were unlisted, one might assume that the views were a close match to the clicks. However, this was not the case with the 360 ad, it had traffic from people copying and sharing the URL peer-to-peer. Ultimately, the 360 ad campaign delivered more value and engagement for the brand, with a lower cost-per-view given the organic shares. 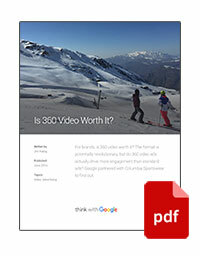 You can read the full case study over on the Think With Google Blog, Is 360 Video Worth It? As 360 video evangelists, this is the type of outcome we expected, but Google has now provided the industry some much needed validation with this real-world example. This test only scratches the surface of what we can learn about how people will use this new medium, and we at 360 Labs hope to be involved in many more projects like this in the future. For now, it’s evident that the forward thinking brands who are embracing this new medium will find success in driving more meaningful interaction and engagement with 360 video. "I just wanted to make sure you guys knew how impressed we have all been working with you guys -- fast, great work, deeply expert, super flexible. I know everyone on our side is very excited with where the work is headed, and has really valued the partnership with you all."